Wyoming Center for Political Economy: Did DWS Create Its Own Wage Gap? Did DWS Create Its Own Wage Gap? On October 8, the Department of Workforce Services (DWS) released its study on the alleged gender wage gap here in Wyoming. Contrary to the false narrative that Wyoming is worst for women, our state is a classic example of what happens when men and women gravitate to industries they are best suited for. For example, how many women can endure the hard work in the minerals industry? Just to take a personal example: there is no way my grandmother would have been able to do the work my grandfather did hauling iron ore out of the underground in sub-Arctic Sweden. There was also a reason why there were no women on the fire-and-rescue crews I served with; how many women can carry a full-grown man over their shoulders out of a burning house, wearing 50lbs worth of protective gear? The raw gender wage gap in this analysis was $0.28, meaning that on average women earned $0.72 for every dollar paid to men. By analyzing 121 variables and 11 comparison variables in the decomposition analysis, the adjusted wage gap became $0.12, meaning that women earned $0.88 for every one dollar paid to men. Variables that took into account age, marital status, number of children, size of business, private or public sector, having multiple jobs, workforce turnover, education, program of study, experience, hours worked, industry, occupation, and location helped identify $0.15 of the raw gender wage gap. All of a sudden, the alleged gender-based wage gap has been reduced by more than 53 percent. The remaining portion of the 28 cents that the DWS calls the "raw gender wage gap", is left unexplained. The remaining $0.13 of the adjusted gender wage gap were unaccounted for due to factors that were unknown, which could include discrimination. Yet the report presents absolutely no evidence - none - to even begin to back up this claim. Instead, the DWS lobs this blanket accusation out there, suggesting that Wyoming employers pay women less simply because they are women. This is, of course, serious and unprofessional: every male employer is now implicitly branded as a misogynist who pays some employees less merely because of their physical character traits. A tax-paid agency should hold itself to higher standards. Their accusation also falls on its own lack of merits. If the DWS had just one wage-discrimination case from one court in Wyoming to show for it, they would have referenced it, right here in their attempt to "explain" the alleged 13-cent gender wage gap. Until there is hard evidence that discrimination exists, the DWS and everyone else crying wolf should put their accusations to rest. That said, as a political economist I should not be surprised at the suggestion of discrimination. It is endemic in the social sciences that theoreticians fill gaps in empirical studies with their own more or less bizarre ideas. One of the more famous is the Solow Residual: Robert Solow, a Nobel Economics Memorial Prize laureate, tried very hard throughout his career to explain what causes economic growth. He was able to explain about half of all growth with a number of different variables - which ones are less important here and now - but the other half remained unexplained. Naturally, yet regrettably, Solow and others began speculating and surmised - to put it nicely - that government spending on education was the solution. Now we have been served another speculative nothing burger, namely that some 47 percent of a wage gap is explained by discrimination. Hopefully, we will not rush off and make the same mistake again as we made based on the Solow Residual: this time, let us actually ask for some evidence before we accept speculation as facts. In Chapter 1 of the DWS study, they reference another publication that attributed 2-12 percent of the gender wage gap to discrimination. That is a major interval in itself - and possibly defined as discrimination by the same speculative approach - but at least it is much less than what is alleged in this study. It would have been nice of the DWS to intelligently discuss the referenced study and their numbers, in comparison with their own. For this research, R&P economists used the logarithm of annual wages because it transformed a skewed distribution into a normal distribution that would make it acceptable for the use of linear regression analysis, as annual wages for both genders were skewed towards the lower end of the wage distribution. Think of it this way: you are planning to build a house on an incline, but it is easier to build it if you use blueprints for a house on flat ground. The result will not be good, but it was easier to build. By the same token, it was easier for the DWS economists to do their study if they adjusted reality to their linear-regression model, than if they adjusted their methodology to reality. I can understand that; this is how economists are trained these days. However, the result they got was a picture of reality as reality would look if it matched their model. Perhaps the worst part is that this methodological trick - I would use a stronger word but this is a public forum - actually creates a wage gap in itself. It is well known that women make less than men, but not because they are discriminated against. They make less because of the reasons that the DWS was able to establish: age, marital status, having children, hours worked, choice of industry, occupational experience, etc. However, by assuming that wages in reality were "normally" distributed, the DWS economists created a world of wage distribution where women "should" make the same as men regardless of these characteristics. Then they put reality over this model and found a gap they could not explain. 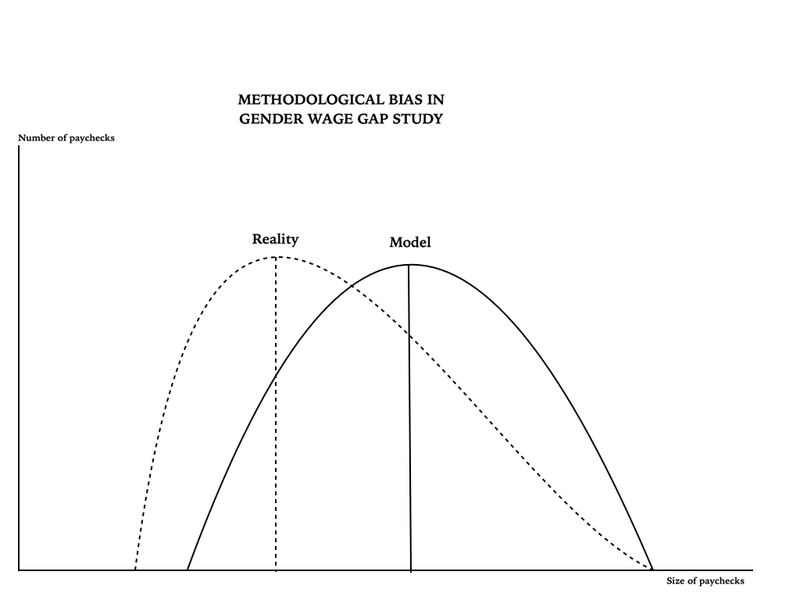 I have not seen their raw data, nor have I seen their model, but I would not be the least surprised if the entire 13-cent "unexplained" wage gap in the DWS study can be explained by this methodological - well, trick. The DWS study is not alone in adjusting reality to a quantitative method. Economists, again, do this all the time, which is why I have abandoned econometrics and rely predominantly on traditional methodology from political economy. It is less precise in its quantitative prediction, but it comes without the kind of rosy glasses that make you see the world as it is not. Unfortunately, it looks like we have yet another example of economists being exactly wrong. It is also an example of how econometrics has hi-jacked another important, tax-paid research outlet in our state. The forecasting debacle over at CREG still stands out, but if this DWS study becomes the foundation of legislation, its impact could easily rise to the same prominence. Thank you. I never studied economics and appreciate your time in explaining all this in lay terms.